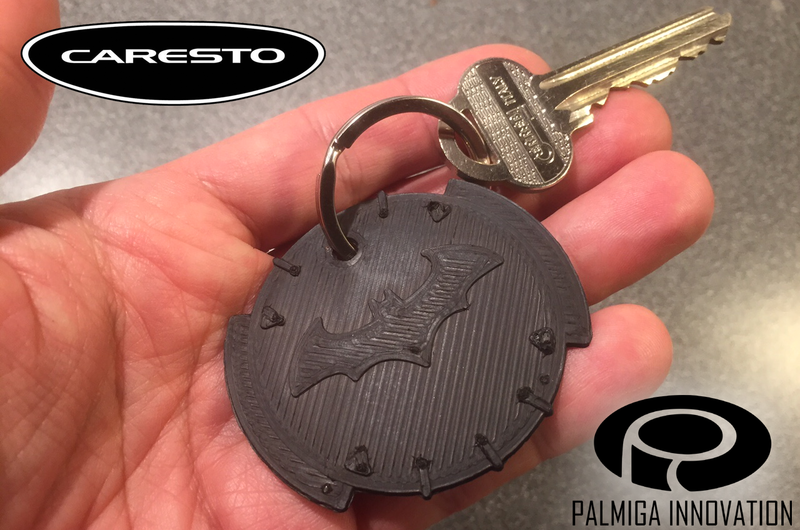 Free Caresto Arkham Car Keychain files for 3D printing now available on Pinshape. 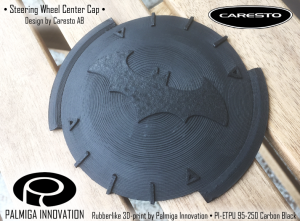 These versions are flat and the scale is 50% compared to the originally 3D printed part. The original was 3D printed by Palmiga Innovation, using PI-ETPU 95-250 Carbon Black filament. This one of a kind car is built by Caresto to be part of Gumball 3000, 2016. The design is based on the car from the Arkham knight game but has been redesigned and manufactured with drivability and full functionality in mind. The car is BIG. The wheel base is 3.40 meters and the width of this special car is 2,5 meters. The special high rigid tubular frame is manufactured to provide good handling and give a solid feeling. Front and rear suspensions are fully independent and made with double wishbones connected to the coil over shock absorbers, up front through a special designed aluminum push rod. To power the car, we have used a 560hp V 10 engine connected to a paddle shift gear box affecting the 26″ wheels. To stop the car we have used ABS supported 8-pot Brembo calipers in front and 6-pot in rear all connected to big brake discs. The complicated all carbon fiber body has been made from full scale moulds which are milled out from the CAD drawings. A lot of effort has been made to the design of the drawings and moulds. This to get the correct stance with full working systems and parts that will work together. Inside the car the driver and the passenger can enjoy the interior in a combination of black soft leather and “see trough” fabric, all kept together by golden stitches. The interior lights up in seats, floor and pedals when the cockpit opens up fully electrical operated. All comfort functions such as climate system, power steering, fantastic sound system, etc helps to make this car a comfortable driver, even that the look is hard as steel. The elongation at break is only 250%.